December’s “Let’s Do Lunch”, number 15, came off without a hitch on Tuesday, December 8, at Jimmies Restaurant in Mint Hill. In addition to our Christmas theme, we helped Beverly (Smith) Garmon celebrate her birthday. 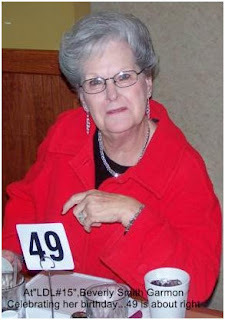 That’s a table number marker in the picture, not her age…though we’d all settle for that, wouldn’t we? 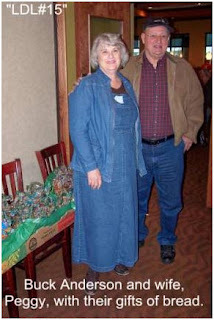 Buck Anderson and his wife, Peggy, were down from “God’s country” up in Fletcher, NC, bringing a wonderful gift of homemade bread for everyone. See what you miss when you don’t come. This was the fifth time they’ve made the long drive to be with us, and it’s so appreciated. Of course, they had pictures of their beautiful new grandson. 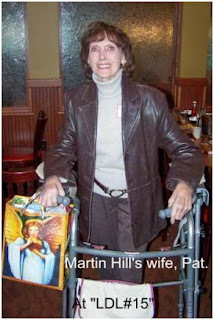 Martin Hill’s wife, Pat, still mending from her broken hip, was able to come for the lunch. 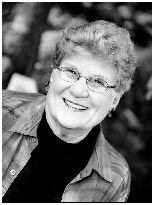 Pat is still in rehab and looking forward to being at home in another week, just in time for Christmas. The CHS’54 Christmas project again this year was to bring non-perishable foodstuffs for the benefit of Loaves and Fishes. 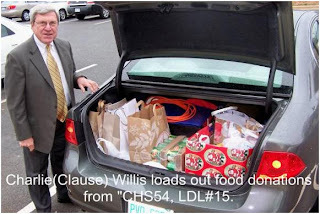 Charles (CharlieClause) Willis did the honors by loading up the trunk of his car to make delivery of our collection.